Can you predict which of your Twitter and Facebook messages will go viral? UCLA psychologists believe they know how. “Our study suggests that people are regularly attuned to how the things they’re seeing will be useful and interesting, not just to themselves but to other people,” said the study’s senior author, Matthew Lieberman, a UCLA professor of psychology and of psychiatry and biobehavioral sciences and author of the forthcoming book, Social: Why Our Brains Are Wired to Connect. “We always seem to be on the lookout for who else will find this helpful, amusing or interesting, and our brain data are showing evidence of that. In the first part of the study, 19 UCLA students (average age 21), underwent functional magnetic resonance imaging (fMRI) brain scans at UCLA’s Ahmanson–Lovelace Brain Mapping Center as they saw and heard information about 24 potential television pilot ideas. It turns out, there is. 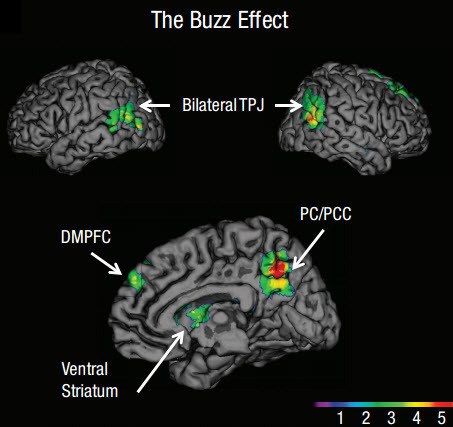 The psychologists found that the interns who were especially good at persuading the producers showed significantly more activation in a brain region known as the temporoparietal junction, or TPJ, at the time they were first exposed to the pilot ideas they would later recommend. “We wanted to explore what differentiates ideas that bomb from ideas that go viral,” Falk said. “We found that increased activity in the TPJ was associated with an increased ability to convince others to get on board with their favorite ideas. Nobody had looked before at which brain regions are associated with the successful spread of ideas. Making this judgment will activate these two brain regions. If we’re playing poker and I’m trying to figure out if you’re bluffing, that’s going to invoke this network. And when I see someone on Capitol Hill testifying and I’m thinking whether they are lying or telling the truth, that’s going to invoke these two brain regions.